During BFR training, a patient or athlete works out with a narrow, elastic band around the upper portions of the exercising arm or leg. This band partially restricts venous blood flow but does not affect arterial inflow to the extremity. Doing this produces a systemic response comparative to heavy weight training. Performing high repetitions of a particular exercise while wearing the elastic band and using light weights will allow the patient to receive the strengthening benefits of heavy lifting without the stress to tissues that may be healing from a recent injury or surgery. 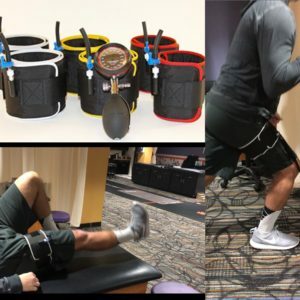 In a nutshell, exercising with lighter weights while using blood flow restriction causes a local disturbance of homeostasis, as the working muscle does not receive enough blood flow to sustain contractions. This creates a release of autonomic and anabolic hormones that move throughout the body. This systemic response augments the local response, causing increased protein synthesis. Because little damage is done to the soft tissue by avoiding heavy weight lifting, improvements in strength and endurance can come quickly. All tissues both proximal and distal to the blood flow restriction bands can benefit from these effects. UPTSM takes both a comprehensive and innovative approach toward the treatment of non-operative and post-surgical spinal pathology. 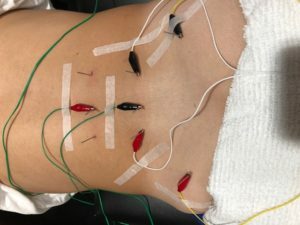 Our keystone toward providing the necessary spinal stability and reducing the movement impairment associated with pain is the Back Project’s, ATM2 system (http://www.backproject.com) Our advances in spinal rehabilitation are unparalleled. The Alter G anti-gravity treadmill (http://www.alterg.com/) uses NASA technology to reduce body weight and thus allows patients to exercise with reduced or no pain. Our Alter G anti-gravity treadmill provides a safe environment for patients with arthritic and/or replaced hips, knees, and ankles to normalize the way they walk with less gait compromising symptoms. This innovation helps accelerate the rehabilitation process and also compliments our lumbar spine and foot ailment rehabilitation programs. The general running population and running athletes are afforded an environment to train often with even healing stress related injuries. The human body is a complex chain made up of a series of links. No one body part or system exists without the direct and in-direct interaction with numerous other systems. Hence our physical therapists perform a whole body examination knowing that pathology does not occur in a vacuum. Analysis of the movement mechanics of our patient’s is enhanced with slow motion cinematography and video analysis. Not all light therapy is LASER and not all LASERs are created equal. UPTSM uses the performance leader in class 4 deep tissue lasers manufactured by Light Force, (www.litecure.com/medical/). This powerful LASER accelerates the normal healing process while reducing inflammation and pain. 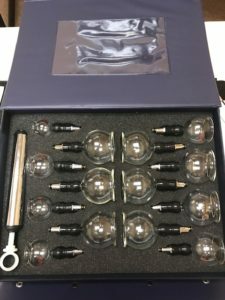 Not to be confused with non-laser light therapy or “Cold” class 3 LASERs, the Light Force class 4 LASER used by UPTSM therapists is a remarkable modality that often provides immediate pain relief and is unparalleled by any other modality. 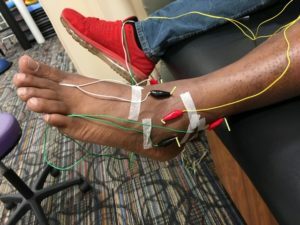 Our patient’s progress at UPTSM is often enhanced by our therapist’s use of instrument assisted soft tissue mobilization (IASTM) or the Graston technique (www.grastontechnique.com/home). Relief of myofascial restrictions causing movement impairments and pain allows for improved and accelerated rehabilitation outcomes. Discharge from physical therapy and release to sport or physically challenging employment is not left up to chance at UPTSM. 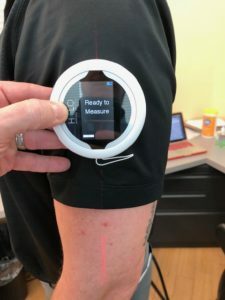 We employ numerous screening systems to compare our patient’s movement ability to normative data that is gender, age, and sport specific (http://www.strengthandconditioningresearch.com/functional-movement-screen-fms/). The physical therapists at UPTSM are happy to examine and consult with anyone desiring information regarding an injury. Our goal would be to assess the nature of your complaint and provide a meaningful understanding of your problem and a appropriate care recommendation. The physical therapists and athletic trainers at UPTSM function as members of a healthcare team. Medical referrals from physicians for the services of physical therapy are routinely received and guide the treatment process. We can also expedite your entry into the healthcare system by assisting you to a physician with the appropriate specialty to help you. UPTSM is a clinical site for mentoring of Clemson University students interested in the professions of physical therapy and athletic training. Observation opportunities will be coordinated through recommendations made by student advisor, Ms. Jessica Owens, and after a successful interview by either Dr. Dana Van Pelt or Dr. Joseph Cannisi - Physical Therapists/Athletic Trainers. UPTSM at Clemson University will also serve as a site for doctorate students in physical therapy curriculums from universities across the country to complete their internship and didactic requirements. Two year graduate assistantships for certified Athletic Trainers with the interest in improving their clinical competencies in rehabilitation are also available (make inquiry with Christopher Cox, Assistant Director - Intramural Sports in Campus Recreation, 203a Fike Recreation Center/Phone (864) 643-1344. We are a highly skilled, evidence-based physical therapy practice providing the highest quality rehab experience available. Founded in 2016, UPTSM is a satellite location of the Palm Beach Institute of Sports Medicine in Boca Raton, FL.